This standard Aja-Kleen was modified for cleaning a family of dies using a 150 degree F flashpoint solvent. 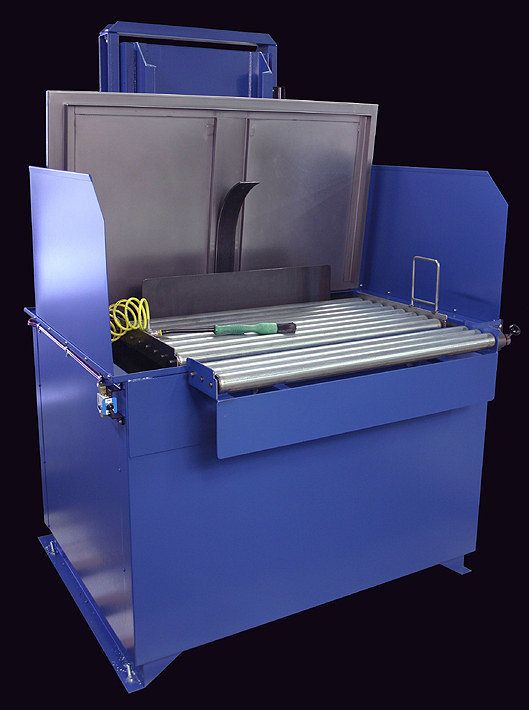 The customer uses a roll-a-round cart with transfer rollers at a specific load/unload height. 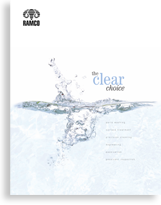 The RAMCO Aja-Kleen CM48 was made to mate-up with the customers cart. Side and rear splash guards were installed to prevent any spillage outside the system during normal operation of the agitation and/or flow-thru brush. The system used our standard oscillating elevator to transport the dies into and out of the working zone and toposition and move the dies within the working zone. The process includes vigorous vertical oscillation in the solvent followed by hand detailing, as required, using a flow-thru brush. 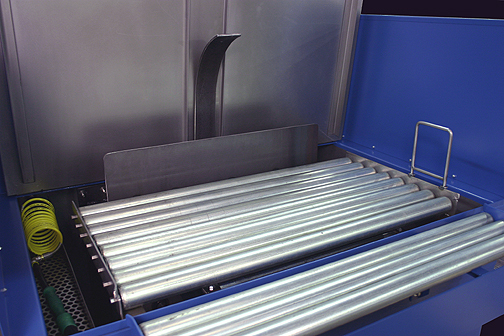 The flow-thru brush is stored in a recessed section of the washing chamber. It is powered with an air diaphragm pump. The cover automatically opens and closes in sequence with the elevator. The system is inherently explosion proof using all pneumatic components.